The land, the waters, the resources, the environment have always been the source of life, culture and spirituality of the Ditidaht People. Clear air, pure water and the food of the forests and the waters of our Territory have sustained our people, our economy and our traditions. That we hold the wealth of our Nation and the use of our lands, waters and resources in the future as we did in the past, to the common good and benefit of all Ditidaht, by fostering development that is based on the principle of caring for and maintaining our physical and spiritual linkages with our lands, waters and resources for all generations. Ditidaht First Nation is governed by an elected Chief and 4 councillors. Elections are held every second July in odd years. 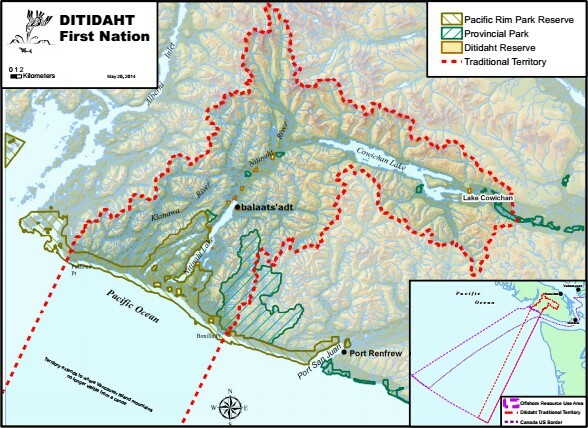 Ditidaht traditional territory is large. It stretches inland from Cowichan Lake, down through Nitinat Lake, and to the coast between Bonilla Point and Pachena Point. Our territory also reaches out to sea all the way to the salmon, halibut and cod banks that feed our people. It includes the headwaters of streams and rivers that drain to the coastline. This video provides an introduction to the extensive lands and waters within Ditidaht traditional territory, highlighting a selection of areas used and inhabited by the Ditidaht for generations. Ditidaht First Nation retains copyright over all information provided on these videos. 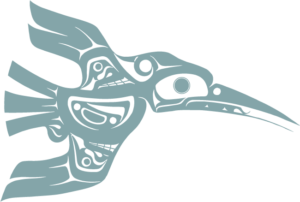 These videos do not represent the entirety of Ditidaht Indigenous Knowledge or Ditidaht’s oral histories and do not address all matters related to Ditidaht’s Aboriginal rights, Aboriginal title or Ditidaht’s traditions and culture. All information on these videos is provided for community educational and illustrative purposes and may not be used for any other purpose without the express written consent of Ditidaht First Nation Council including, without limitation, any regulatory or other government decisions, industry consultation processes or any court or administrative proceedings. The Ditidaht Economic Development Corporation is working on a variety of projects designed to optimize existing resources and businesses and identify new opportunities. Learn more here.